Compete for a chance at snagging one of 32 exclusive spots in Phase 1 of the GT Academy National Finals. Register to compete at the Hard Rock Hotel (207 5th Avenue, San Diego, CA 92101) on Thursday, July 12th from 10:00am to 4:00pm, and compete for top lap time in Gran Turismo 5. The top competitor will walk away with one-of-a-kind GT Academy swag. Reveal of the Power Rangers 3D Progressive Mural. Join the cast of the number one kids’ action series, Power Rangers Super Samurai, to unveil POWERful new information and surprises surrounding the 20th Anniversary season next year, Power Rangers Megaforce. Don your favorite superhero costume and join your fellow heroes for this pubcrawl of some of San Diego’s best bars, hosted by PubCrawls.com. Prices starting at $10 for one day, $15 for both. Group discounts available. Must be 21+ to attend. Celebrate 100 years of Chuck Jones with an artist meet-and-greet with Tennessee Loveless. The artist will be signing and dedicating artwork purchased at this event. The Hub Network’s popular show/band The Aquabats returns to the House of Blues San Diego for live music event that is sure to please both kids and adults alike. All ages welcome, though persons under 18 must be accompanied by a parent, guardian or responsible adult 25+ with written authorization from a parent/guardian. Tickets are $27.50 per person. 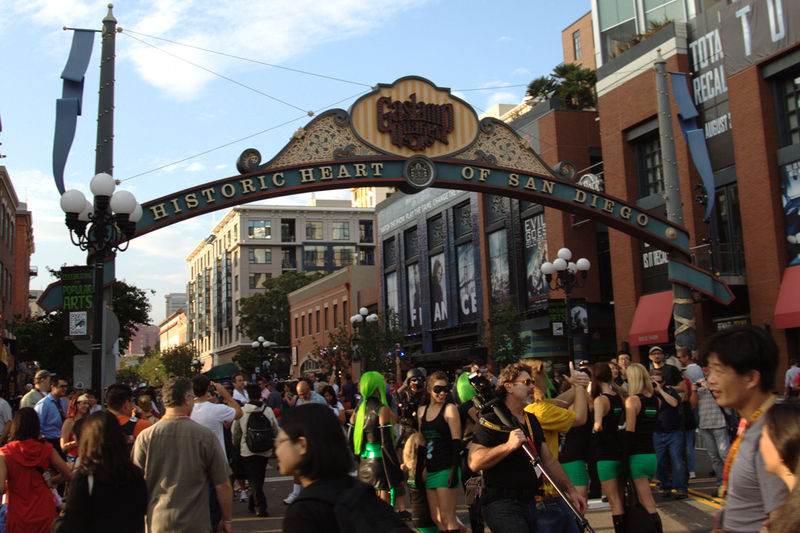 What: Each year, the Gaslamp Quarter’s scariest lodgings opens its doors exclusively for Comic-Con International. Get a sneak peek of the scares to come later in the year during Halloween Time in the Gaslamp. Wind your way through the terrifying corridors and try not to lose your sanity along the way. Tickets are available at the door for $16.99 per person, cash only. Not recommended for children under 10. What: Kevin Smith’s tradition of hosting off-site comedy shows continues at the House of Blues San Diego this year, with host of “The Joe Schmo Show,” Ralph Garman accompanying him for boundless shenanigans. Must be 21+with valid photo ID to attend. Tickets range from $46.50 to $67.50. Know of another great event in the Gaslamp Quarter? Let us know in the comments below. This entry was posted in Insider Tips, San Diego Events and tagged comic, comic-con, con, Gaslamp Quarter by Brent Bernasconi. Bookmark the permalink.